Priority‘s Financials module is a complete, comprehensive system, supported by advanced technology, and capable of carrying out everyday financial transactions easily and efficiently. The system allows for full multi-year continuity of accounts. It can maintain financial data for several companies simultaneously, as well as create links between them (consolidated reports). Accounts may be maintained both in the local currency and a second currency of your choice (dual-currency package only). Foreign currency accounts can also be managed in a third currency. The system offers a large spectrum of balance sheet, P&L and trial balance reports, which can be run by either transaction date or reference date. In the dual- currency package, such statements can be obtained in local currency, the second currency and/or with linkages to a price index. In addition to the wealth of available reports, the Financial Statement Generator provides the capability of designing and producing customized statements, with a variety of structures, criteria and sorting methods determined by the user. 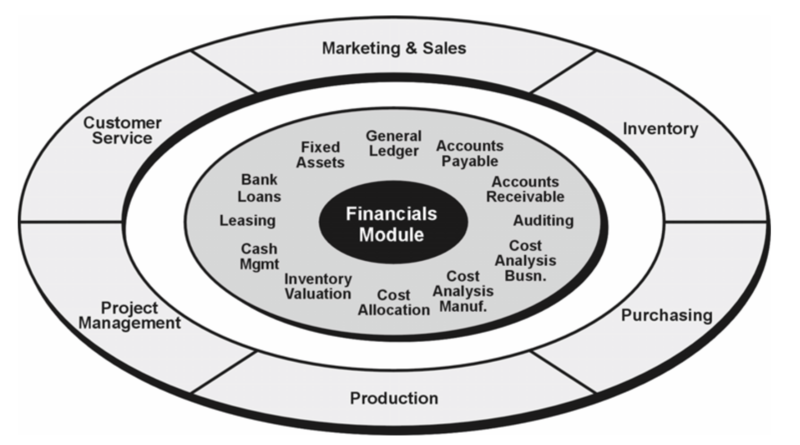 The strongest advantage of Priority‘s Financials module is its direct link and integration with the rest of the modules. Any relevant transactions carried out elsewhere in the system come to be expressed directly and immediately in the Financials module. Take, for example, the Accounts Receivable module. Customer invoices can be generated directly from a sales order or customer shipment, causing, in turn, automatic updates of balances (unbilled shipments). Prices and payment terms are automatically imported from price lists, price quotations or sales orders. The Accounts Payable module works in a similar way. Vendor invoices are recorded and simultaneously compared (in regard to both quantities and prices) to the voucher documenting the receipt of goods into the warehouse. Furthermore, payments are made in accordance with vendor price lists and pricing terms recorded in the relevant purchase orders. These transactions and others can be immediately posted to the ledger without the need for additional keystrokes. This integration of the Financials module with the rest of the system allows for close and efficient supervision of every process in the organization (audit trail). In essence, it eliminates the gray areas between inventory control, sales, project management, purchasing, production management and customer service, on the one hand, and financial processes, on the other. For instance, while working on an account ledger, it is possible to move, with the touch of a key, from any transaction recorded in the account to the original transaction document (invoice, receipt, payment, deposit). The Cost Analysis and Inventory Valuation modules offer actual costing (by moving average or FIFO), standard costing, transaction costing and inventory valuations (standard and actual). Cost analysis is directly affected by the various transactions recorded in the Inventory module and by those financial transactions that are connected to them. Cost analysis results serve as the basis for calculating COGS (Cost of Goods Sold). Inventory account management and the ability to record journal entries for inventory transactions enable you to determine the value of inventory at any given time. In addition, the COGS program handles irregular or problematic inventory transactions such as disposals and conversions. Most computerized systems manage budgets by opening accounts in the general ledger, meaning that an expense will not be recorded until its invoice is received. Yet, in actuality, there are likely to be charges against the budget (such as purchase orders or recorded receipts of materials) for which invoices are not yet available. In Priority, charges to the budget are traced through the entire chain of purchasing transactions: from the purchase requisition to the purchase order to warehouse receipts and finally the invoice. This is achieved by “rolling” charges from one stage to the next (requisition to order, order to receipt and so on) as each transaction is recorded. This tracing of budget charges takes place for both income and expense items. The Bank Loans module records loans taken by the company. It allows different payment schedules to be set for loans at either fixed or variable interest. You can use this tool to create loan models according to a variety of parameters, in order to determine how different variables affect bank payments. In addition, you can record loan payments automatically in the ledger, record pre-payment of loans and analyze loan feasibility. The Leasing and Company Loans module records and manages loans or leasing deals provided by the company to its customers. This module supports financing transactions, installment payments, payment schedules (as in the Bank Loans module), automatic preparation of monthly invoices, special customer charges (e.g., insurance, special fees) and guarantee loans (including the issuing of credit memos). Priority‘s Cost Allocation module enables you to analyze the profitability and costs of various sectors of your enterprise (e.g., departments, projects, product lines). This is achieved by delineating profit centers and cost centers. Profit centers incur direct costs and generate revenues; cost centers incur indirect costs that are then distributed among profit centers.